As featured on The Project (Channel Ten), A Current Affair (Channel 9), ABC Radio and in Money Magazine. You work hard for your money, and you work even harder to set and keep a budget that makes the most of it. But when tax time arrives, do you feel shorted on your return? Nearly everyone has to pay taxes, but the government is only entitled to so much of your money. You might be letting them keep hundreds or even thousands of dollars that rightfully belong to you. No matter what your accounting habits have been so far, you can still claim what's yours. The book also contains advice on related matters, including tax-effective investments, tax planning, and how to find a great accountant. All information has been updated to reflect tax law changes wrought by the May 2014 budget. 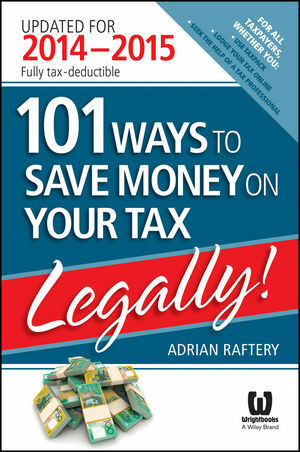 If you're tired of paying too much tax and seeing too little return, 101 Ways to Save Money on Your Tax—Legally! 2014 – 2015 is your comprehensive guide to putting things right, starting now. ADRIAN RAFTERY has over 20 years’ experience in providing accounting services and financial advice to businesses and individuals. As a recognised tax expert, Adrian appears frequently on TV and contributes to magazines and newspapers. Visit www.mrtaxman.com.au.